I am Terry from Holland and I would like to do a review of GhostReader from ConvenienceWare. Let me start by the problem to be solved. As a graphic designer, I am often the last person to see a text before it is multiplied in a huge quantity. So I need to be very good in proofreading. But whenever I just want to read, I am still scanning for typo’s, punctuation errors and grammar mistakes. It takes forever for me to finish a book. Fortunately, many books are available as audiobooks. But many other books are not. Of course my Mac comes with text-to-speech capability. For example, Pages can read its text out loud. But it is not easy to pause a long text and continue the next day. Wouldn’t it be great if you could turn longer texts into an audiobook? This is where GhostReader comes in. It is a mac application to convert text into audio, using synthetic speech. There are many good synthetic voices available from Infovox, including voices that sound happy, sad, shouty, whispering, mischievous, young or old. There are 24 available languages, including Dutch, my native language. 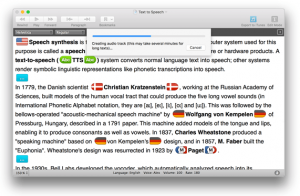 If you don’t want to spend extra money on synthetic voices, you don’t have to, because GhostReader can also use the synthetic voices that come with your mac. So what’s the downside? Text-to-speech has its limitations. A computer doesn’t understand language like we do. For example, it tries to pronounce abbreviations verbosely. But it doesn’t know if “No” followed by a dot is the abbreviation of number or it is just the word “no” at the end of a sentence. So you will hear an occasional “number, number” when the text is in strong denial. Another example was when I was reading a theological book. The synthetic voice I used, made the writer sound like he had Tourette syndrome by the way he pronounced Jesus Christ. GhostReader is far from perfect, but it saves me a lot of time I would have spent reading. If a book is not available as an audiobook, I can buy an e-book, crack it open, harvest the HTML files from it and convert them using GhostReader. It takes some effort, but to me it is worth it. GhostReader comes in 2 versions, both of which are available in the mac app store. The normal version is $25. I personally use GhostReader Plus, which costs $40. The main advantage to me is that I can use tags to change the voice if I have a document with mixed languages. Or, if I want some parts faster, and other parts slower. The voices are sold separately for $15 each. You can demo each voice for a month before you buy. In my case, my reading tempo is a profession related issue. But synthetic speech can also benefit People with dyslexia or a visual impairment. I hope you want to give GhostReader a chance. Great review. I’m going to try it out.